It's good to have multiple size screws to choose from when you're experimenting with something like a mechanical deer deterrent or trying to fix a broken chair. Dollar General has a package for 1.50 that provides what I consider a good collection at a fair value. Sometimes I've seen large hardware stores charging this much for a small bag with 4 or 5 of the bigger ones in this group. 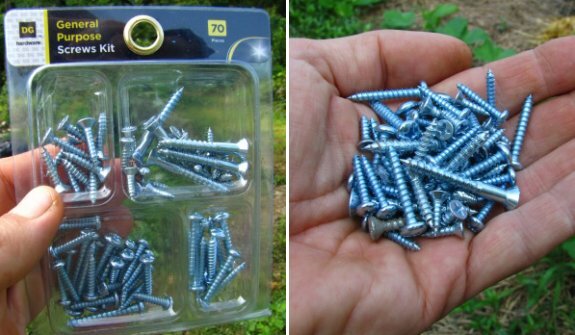 I also discovered this package will provide you with just the right size rounded head screw that is perfect for attaching an electric motor to a piece of appearance board if you ever have the need to build a mechanical deer deterrent, which is still working at protecting our garden from invading deer.